When the body is under stress or constent inflammation it will deposit calcium to our bones. This added ‘bone growth’ is designed to relieve the added stress/pressure to our connective tissue. In the case of a heel spur, added calcium to the heel bone (calcaneus). It usually forms at the bottom underside of the heel bone where the plantar fascia attaches. This calcium deposit forms over a period of many months. Heel bones can very in shape and size from person to person. An irregular shape heel (calcaneus) can cause the tissue to twist (plantar ligament and Achilles tendon) or a smaller heel bone will put additional stress on tendons and ligaments. Everyone can be affected by heel spurs, however, certain groups of people have an increased risk. For example, Plantar Fasciitis is a common running injury. People who walk a lot are much more likely to have heel spurs or people who play golf or play tennis. Over-weight people are also more at risk for heel bone spurs as our feet are not designed to carry around extra weight. As a result the ligaments under the foot are placed under constant stress, which inevitably will lead to foot problems. Major symptoms consist of pain in the region surrounding the spur, which typically increases in intensity after prolonged periods of rest. Patients may report heel pain to be more severe when waking up in the morning. Patients may not be able to bear weight on the afflicted heel comfortably. Running, walking, or lifting heavy weight may exacerbate the issue. A thorough history and physical exam is always necessary for the proper diagnosis of heel spurs and other foot conditions. X rays of the heel area are helpful, as excess bone production will be visible. Podiatric Care for heel spur syndrome may involve keeping the fascia stretched out by performing exercises. Your doctor may also suggest for you to be seen by a physical therapist. You probably will be advised on the best shoes to wear or some inserts for your shoes. Your podiatrist may suggest that a custom made orthotic be made to allow your foot to function in the most ideal way especially if you have excessive pronation. A heel lift may be used if you have a leg length discrepancy. Medical treatment may include anti-inflammatory oral medications or an injection of medication and local anesthetic to reduce the swelling and decrease pain. If a bursitis is present the medication may greatly improve the symptoms. Your podiatric physician may also recommend a surgical procedure to actually fix the structural problem of your foot. Surgery to correct for heel spur syndrome is a common procedure which releases plantar fascia partially from its attachment to the calcaneous (heel bone). This part of the surgery is called a plantar fasciotomy due to the fact the fascia is cut. 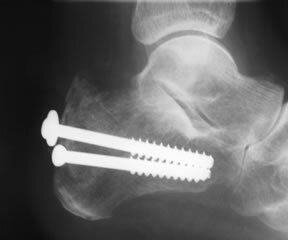 This is most often done through an open procedure as any heel spur or bursa can be removed at the same time. If the spur is not removed during the surgery, it will probably be just as successful, as the large spur is not the true problem. Some physicians use an endoscopic approach (EPF) where a small camera aids the physician during surgery with typically smaller incisions on each side of your foot. Although many people with plantar fasciitis have heel spurs, spurs are not the cause of plantar fasciitis pain. One out of 10 people has heel spurs, but only 1 out of 20 people (5%) with heel spurs has foot pain. Because the spur is not the cause of plantar fasciitis, the pain can be treated without removing the spur. Heel spurs can be caused by several things. Anything that can cause the body to rebuild itself can lead to a bone spur. A heel spur is a natural reaction of the body to correct a weakness by building extra bone. One of the most common causes for the development of heel spurs is the wearing of shoes that are too tight. That?s why more women suffer from heel spurs more than men. Athletes who tend to stress their feet a lot, people are overweight who have more pressure on their lower extremities and the elderly also tend to suffer more from heel spurs. Heel spurs may or may not cause symptoms. Symptoms are usually related to the plantar fasciitis. You may experience significant pain. Your heel pain may be worse in the morning when you first wake up or during certain activities. Many treatment options exist, and good results are often observed. Generally, a calcaneal spur develops when proper care is not given to the foot and heels. It is often seen as a repetitive stress injury, and thus lifestyle modification is typically the basic course of management strategies. To alleviate heel spur pain, a person should begin doing foot and calf workouts. Strong muscles in the calves and lower legs will help take the stress off the bone and thus help cure or prevent heel spurs. Icing the area is an effective way to get immediate pain relief. Surgery is used a very small percentage of the time. It is usually considered after trying non-surgical treatments for at least a year. Plantar fascia release surgery is use to relax the plantar fascia. This surgery is commonly paired with tarsal tunnel release surgery. Surgery is successful for the majority of people.